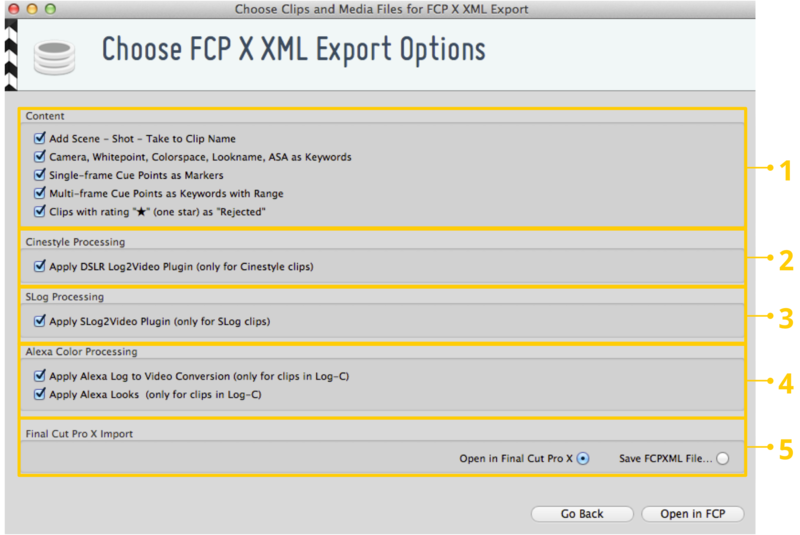 For the transfer of metadata via Final Cut Pro XML files (.fcpxml) the clip metadata is mapped accordingly and depending on the user-defined options as you can see in figure 1. Clips marked as flagged in Silverstack are marked entirely as favorite in Final Cut Pro X. Clips with rating “★” (one star) in Silverstack are marked as rejected in Final Cut Pro X. You can either immediately open the selected clips in Final Cut Pro X or save them first as Final Cut Pro XML files. The range between in- and out-points in Silverstack is marked with Keyword “In-Out” in Final Cut Pro X. Properties camera index, whitepoint, colorspace, lookname, ASA and label from Silverstack are mapped to Keywords in Final Cut Pro X.
Single-frame cue points from Silverstack are mapped to markers in Final Cut Pro X.
Multi-frame cue points from Silverstack are mapped to a clip range marked with a keyword in Final Cut Pro X.